Hello! 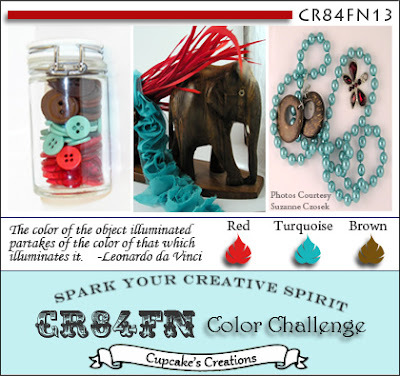 It's time for another CR84FN (Create For Fun) Challenge! Thank you to all who joined us last week.. it was fun viewing all of your fabulous creations! For this week's challenge (CR84FN13), the colors are Red, Turquoise and Brown. These colors really threw me for a loop! I searched and searched (and searched) for some patterned paper either to use or to inspire me and almost had given up when I came across a very old Basic Grey Blush paper pad.. I decided to use the small floral print and add some Vintage Photo distress ink all around. I stamped the doodle frame from Verve's Thankful Accents, added some tiny rhinestones onto it and popped the sanded foil heart in the center. 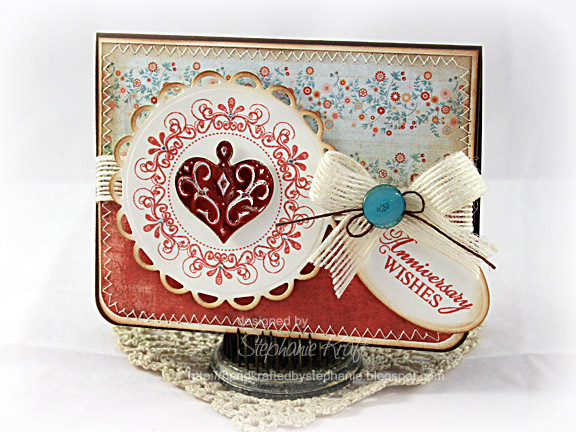 "Anniversary Wishes" is from Wishful Elegance. Accessories: Lacey Circles Nestabilities, Nested Hearts and Tags Five Shapeabilities, Red craft foil from Jewel Tones assortment (Spellbinders); Round-It-All (Zutter), Twine (May Arts), Jute ribbon, Button (Papertrey Ink), Taylor's Tiny Twinkle's (Taylored Expressions), Foam tape, Thread, Sewing machine. Stephanie, I think this is stunning, and you would never have guessed that it threw you!! I adore the papers, the heart and flourish are beautiful, and I love the turquoise button detail! It's brilliant. Beautiful! I love that paper. Wonderful design and love how you stitched around the edges. Perfect touches on a lovely card. Your card has convienced me that I have to try this challenge. The colors scare me but your card is so gorgeous! Wow - thanks for sharing! I love those colors - very Southwest. Your card is just gorgeous - and that foil heart is stunning. Wow, this card is absolutely stunning, Stephanie! I love that foil heart and frame! And your papers are beautiful! TFS! I absolutely love this card! Amazing job, its so beautiful!! All that searching for paper made for one BEAUTIFUL BEAUTIFUL card! 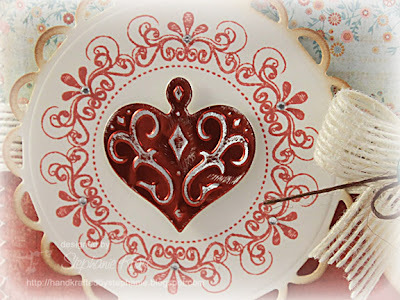 LOVE the tin heart and LOVE that ribbon! So PRETTY! Gorgeous card Stephanie! Great way to use "old" supplies :) Love the doodle frame and pretty foil heart! How pretty! Love the sanded foil heart surrounded by your lovely frame! Stephanie, WOW!!! This card is BEAUTIFUL!!! I love the background DP and the foil heart is fantastic!! Beautiful card. Your choice of papers and embellishments really turned out wonderful-very soft and subtle. Wow, this is just stunning! Love the soft papers and the ornate heart paired with the circle frame. Beautiful! Stephanie, this is absolutely gorgeous! One of my favorite Verve circle frames, too! Gorgeous! That paper looks fabulous with this color challenge. Love the metal heart and the pin. Beautiful card!